Old Portsmouth is a district of the city of Portsmouth. 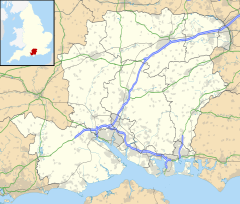 It is the area covered by the original medieval town of Portsmouth as planned by Jean de Gisors. It is situated in the south west corner of Portsea Island. The area contains many historic buildings including: Portsmouth Cathedral, Royal Garrison Church, The John Pounds Memorial Church (Unitarian), the Square Tower and Round Tower and Point Barracks, Portsmouth Point and the entrance to the Harbour. George Villiers Duke of Buckingham was assassinated in the Greyhound Pub in 1628. The area also has several historic pubs including the Bridge Tavern, Still and West, Spice Island Inn, and the Dolphin. It is now also the site of the Land Rover BAR headquarters. The very modern building is not to be considered in keeping with the historic surroundings. This was considered one of the factors in Portsmouth be ruled out of contention for the race to be the UK's next city of culture. This page was last edited on 28 November 2018, at 14:50 (UTC).